Boomerang for Gmail is a Firefox and Chrome plugin that lets Gmail users schedule when emails are sent and received. The plugin has several clever features: Emails can be composed and then scheduled to be sent at a later time. If an incoming message needs to be dealt with later, it can be archived and set to return to the top of the inbox at a scheduled time. And to keep track of important conversations, Boomerang can send a reminder if a sent email does not receive a reply after a certain period of time. 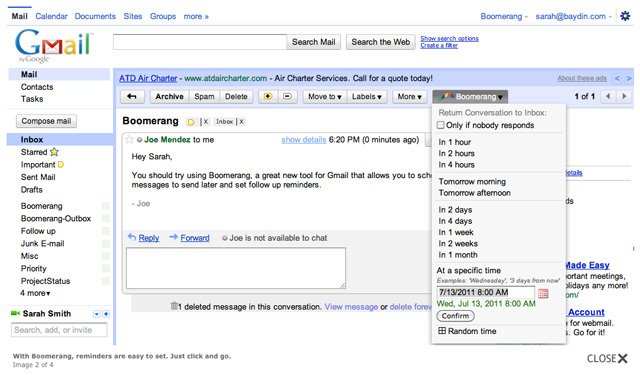 Boomerang is also available for Outlook and Google Calendar. Boomerang was created by Baydin, a Mountain View, California-based software company.